The WeWood Chrono Watch is formed from offcuts of wood that often go to waste. The watchmakers use as much wood as possible to create a unique looking, stylish watch. 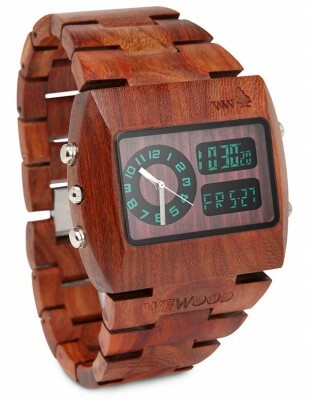 The WeWood Chrono Watch has been created to make use of wood that would otherwise go to waste. The strap and case are made entirely from organic, hypo-allergenic wood, great for those who have sensitive skin and have problems with more traditional watches. The watch features both an analogue and a digital display and is able to be set to different time zones. The watch has a stopwatch, alarm, light and day/date functions and uses a Miyota quartz movement. 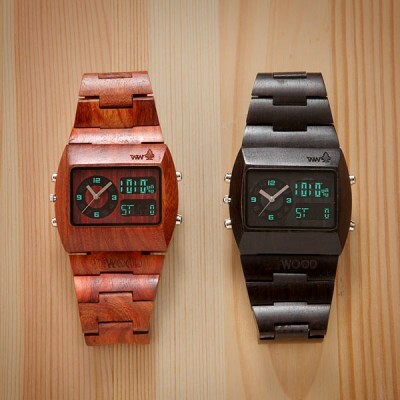 The WeWood Watch is available in two colours, brown and black. The brown watch is created from red wing celtis wood which gives it deep warm colour. This type of wood is commonly used as flooring, it is from the left over scraps that the watch is formed. The black watch is created from ebony, giving it a rich sleek look. Making use of wood that would otherwise go to waste is clearly an environmentally sound idea, to add to their green credentials WeWood plants a tree for every watch purchased. The WeWood Watch is a unique watch that is sure to please any woodwork enthusiast, eco warrior, or those with sensitive skin.